APPROX. 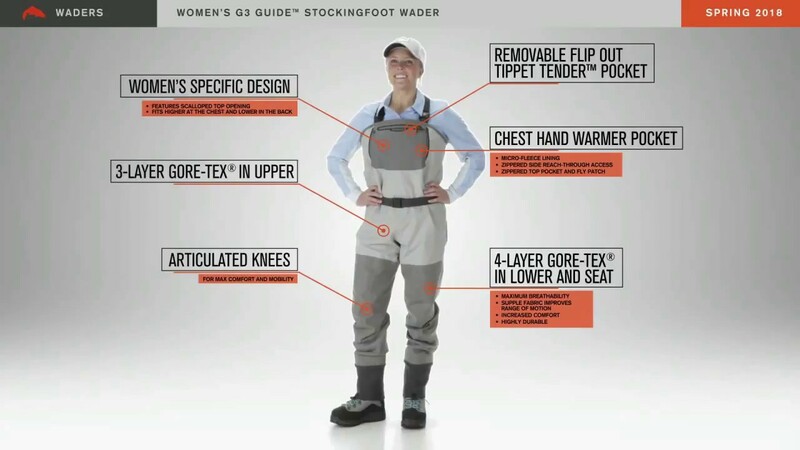 WEIGHT: 40 oz.&sol; 1334 g.
Simms Women's G3 Guide Wader Features Why GORE-TEX®? I have a pair of spring waders from another brand that I love but have worn to death and need something more durable and thicker. The material is stellar and Simms' quality is definitely here. I'm 5'6" 110lbs. The legs are just long enough and the overall length is good. I'm on the lean side and expect an extra room in the body. (1) However, the shape of these waders seem odd as there's not nearly as much room in the legs. I wore a pair of thick fleece pants and i'm struggling for leg room. (2) My other gripe is with the booties size. I wear a size 7.5 normally (size 7 in Salomons) and my toes can't fully stretch out even without socks on. I would move up to medium sized waders, but the size of the body would be too dangerously large. I want to love these but I can't. Simms Customer Service: Thanks for reaching out. (1) If you are experiencing issues with the room in the leg area, please give us a call at (888)585-3570 and we can make sure your wader size fits you properly. (2) We are able to switch out the neoprene stockingfoot size for you. All you have to do is send in your waders into our Repair Shop in Bozeman, MT. To begin the repair process, please fill out your information at http://repair.simmsfishing.com and indicate the stockingfoot size you would like. We will invoice you for the repair after you send in the waders. Thank you. Why don't you guys sell this wader in XXL??? You guys use to sell woman's waders in XXL, I have an old pair. Now you don't, so I have buy mens XL waders. A woman's wader would fit me better and I wouldn't have to have to boot foots changed out. I really like these waders but you don't have my size. Warmth and quality were most important to me while searching for waders. I went up the ladder trying to find good waders and when it came down to it paying a good price for a good pair of waders have shown the best result. These Waders are beyond the quality of what previous waders offered me! 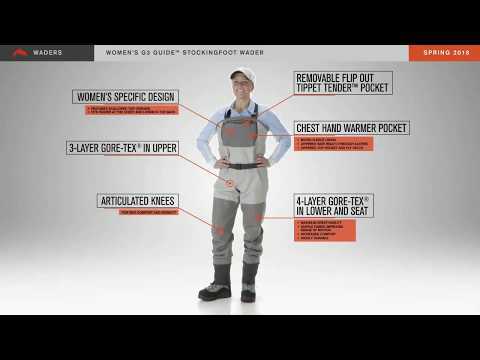 These G3 Stocking foot waders in a size S-Short have the shortest inseam of all other women waders, after I looked at all of the size charts of various brands. This is great for me since I'm 5'1! I also must note what a difference it makes having the neoprene ankle cuffs, my feet feel a lot warmer and snug! You feel all those layers of Gore-Tex... 3 in the Upper and 4 in the Lower Fitting. In previous waders these are the layers that I wish I had so I'm very excited to put these in use!